There will be a farbrengen at Tzemach Tzedek following the 9:30 PM Maariv minyan this Tuesday, 29 Elul, September 23, in honor of the birthday of the third Lubavitcher Rebbe, the Tzemach Tzedek, in 1789. 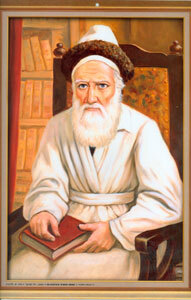 The third Chabad Rebbe, Rabbi Menachem Mendel Schneersohn of Lubavitch (1789-1866), was born on the 29th of Elul. Orphaned from his mother at age 3, he was raised by his maternal grandfather, Rabbi Schneur Zalman of Liadi. Rabbi Menachem Mendel assumed the leadership of Chabad in 1827, upon the passing of his father-in-law and uncle, Rabbi DovBer of Lubavitch. Extremely active in communal affairs, he established and funded Jewish farming colonies which provided a livelihood for thousands of families. He also stood at the forefront of the battle against the "Enlightenment Movement" which, with the support of the Czarist regime, sought to destroy traditional Jewish life - a battle which earned him no less than 22 imprisonments and arrests. In the course of his lifetime, Rabbi Menachem Mendel penned more than 48,000 pages of Chassidic teachings and Halachic exegesis. He is known as the "Tzemach Tzedek" ("a sprouting of righteousness") after his work of Halachic responsa by that name.